If you’re like most content marketers, you’ve become adept at breaking your niche or market down into its component concepts and writing about them in exhaustive detail. But inevitably, you probably find yourself in a creative rut from time to time. When you find yourself at a loss for content ideas, step back and look at your topic from different perspectives. One way to do this is to take a three-dimensional approach to the industry, profession, or niche within which you work. Picture three double-ended arrows: The first imaginary line points right and left, the second one forward and backward, and the third line points up and down. The three lines share a common intersection, so they look like a single point with six arrows radiating from it, each one 90 degrees apart – in other words, a visual representation of 3D space. This gives us a total of six unique “lenses” for looking at our readers’ needs and the content opportunities around us. What trends – both positive and negative – are currently affecting your readers and customers? If these trends continue unchecked, where will this niche, topic, or issue be five years from now? Brainstorm ways you can help your readers and customers to begin preparing now. What forces have shaped this industry, profession, or niche? What lessons can you extract from its evolution? What timeless principles underlie business success in their world that your readers may not be aware of or may have forgotten? Profile the successful leaders that have gone before you in your industry, and focus on the key success factors that have helped them to get where they are today. What can your readers learn from these leaders? These vectors remind us to think about what and who are next to us – adjacent, related industry segments, and competitors who are “running” alongside us. Adjacent topics are those that are at the same level as your niche, and have something in common with it. Adjacent niches are a rich source of ideas for blog posts. Writing about and explaining what’s going on in these closely-connected areas makes your readers aware of important topics and issues they may not have considered. Don’t limit yourself to blog post ideas when thinking about adjacent topics. These adjoining markets also hold potential for information products – including those you can write and sell to your readers. Guest posting on blogs in adjoining niches is another way to grow your influence there and attract more readers to your organization’s website. The right and left-pointing arrows also remind you to be mindful of your competitors, who publish content in the same industry and probably share many of the same readers. But don’t obsess over what they’re doing or imitate them – rather, your job is to differentiate your content, products, services and customer experiences from your competitors. To do this, I recommend that you brainstorm innovative new ways to add value to your readers. You need to take thought leadership of your niche! 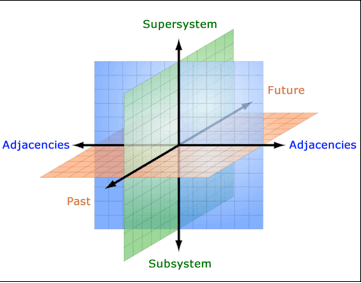 The upward-pointing arrow refers to the “supersystem” – the larger ecosystem of topics of which your industry is a part. For me, the supersystem of my niche of mind mapping software includes visual thinking and information management. Like the adjacent niches, exposing your readers to the bigger ecosystem that surrounds your key topics can be very helpful to them. The bottom-pointing arrow refers to all of the subtopics that exist within your core topic. You should help your readers to explore these areas, of course, but don’t limit yourself to this subset of the ecosystem in which you create and publish content. I recommend creating a mind map with the six axes as the first-level topics. Next, add child topics based on the questions I’ve outlined in this article, as well as any others you may think of. Then invest some time brainstorming topics suggested by these idea triggers, and record them in your mind map. Finally, rate them on their value to your readers and their importance, so you know which ones to tackle first and next. What can this exercise in visual thinking teach you about blog content development? That you need to adopt a variety of perspectives to fully explore your niche and its surroundings, to establish thought leadership with your existing readers and customers and entice new people to check it out. Chuck Frey is the founder and author of the The Mind Mapping Software Blog, the world's leading website covering visual mapping. He also blogs about creativity, productivity and personal development strategies on his personal blog. He has extensive experience in public relations, online marketing, content development and marketing, innovation strategies and creative problem solving techniques. He is an avid photographer.